During the month of November the Environmental Resource Committee of New Gloucester has a display in the library about four insects that damage and sometimes kill your trees. Information and photos of these killers are available . Winter Moth : Actively laying eggs NOW at the base of trees until a hard frost. Emerald ash borer: This one is destroying ash trees across the midwest and other regions in the northeast and has recently been seen in Maine. Many of these may look similar to other insects so try to note their identifying features. The following websites have photos that can help with identification. Have you heard of a program called Paintcare? Now you can get rid of all that paint that you no longer want or need and do so environmentally. This will also reduce the tonnage of the compacter at the transfer station thus saving the town money and help reduce your taxes. Have you purchased paint in the last few years? If so, you are helping to pay for this program. A fee is added to each can of paint you purchase: 35 cents for less than a gallon, 75 cents for a gallon. This fee is NOT refundable but is used to support the program. The purpose of the program is to conserve resources, reduce waste and to recycle as much paint as possible. To date 9 states are participating in the program. Paint is collected and sent to a facility that processes it so it can be reused. Latex, acrylic, oil based paints, primers, stains, metal coating paints plus others are accepted. Cans have to have labels on them and cans cannot be rusty, leaking or paint dried out. It does not matter how old, moldy or dirty the paint is. 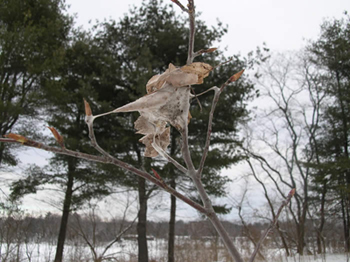 This is the time of the year to check your yards and surrounding areas for brown tail moth webs. Destroy the webs now. At this stage, they do not cause an allergic reaction as they will later in the season. A video on how to destroy the nests at this time of the year may be viewed on the internet at the Maine Forest Service web site. Enter Brown tail moth in the search box. The browntail moth is an insect of forest and human health concern which was accidently introduced into Somerville, Massachusetts from Europe in 1897. By 1913, the insect had spread to all of the New England states and New Brunswick and Nova Scotia. Since that time, populations of this pest slowly decreased due to natural controls until the 1960’s, when browntail moth was limited to Cape Cod and a few islands off the Maine coast in Casco Bay. Browntail moth populations persist on islands and in coastal areas in southern Maine, extending up the river valleys. Browntail Moth Risk Map (pdf | 2MB) The larval stage (caterpillar) of this insect feeds on the foliage of hardwood trees and shrubs including: oak, shadbush, apple, cherry, beach plum, and rugosa rose. Larval feeding causes reduction of growth and occasional mortality of valued trees and shrubs. While feeding damage may cause some concern, the primary concern is the impact on humans from the browntail moth is the result of contact with poisonous hairs found on the caterpillars. Contact of these hairs with human skin causes a rash similar to poison ivy that can be severe on some individuals. Do you know how to compost? Learn how easy it is to do and save money as well as enrich your garden soils. Composting can also save the town money by reducing the amount of tonnage that goes in the hopper. To transport the material in the hopper costs the town over $41 per ton. 30% t0 40 % of material that goes into the hopper is organic matter that could be composted. For the year of 2017, 30% of the tonnage in New Gloucester’s hopper equals 410 tons. At $41 per ton for disposal of just organic matter, the cost to the town was $16.810! Learn more about how easy it is to compost by visiting the display during February at the New Gloucester Library. There is material to take home as well as a drawing for a compost bucket with liners for those that fill out a very short survey about composting. A list of plants that it is illegal to import, sell, export, buy or intentionally propagate as January 1, 2018 can be found on the following web site. The ban includes the listed species and all cultivars, varieties and hybrids. Look under “Invasive Plants” when the page comes up. Botanical as well as common names are listed. Local nurseries are aware of the ban and will not sell you these but you may already have them in your yard and might consider replacing them with a non-invasive. They may also be available from out of state nurseries so recheck the list before ordering from them. At the bottom of the list of invasive plants are several links to plants that are alternates to invasive plants. When attending a plant sale in the community, be aware of the list and also make the seller aware of this ban. Get Out! Nature Walks are volunteer-led regular trips with trained master naturalists and other skilled volunteer leaders. Join them for a well-planned, no-cost, guided adventure occurring once-per-month on Wednesdays, rain, snow or shine. Their programs are jointly offered by the Chebeague and Cumberland Land Trust, as well as the Royal River Conservation Trust. Be mindful of the weather and dress accordingly. Bring appropriate gear, snacks and a thermos or water bottle. Check www.rrct.org for any updates or changes. Nature walks typically involve getting on your knees with a hand lens or standing still for 10 minutes craning up at a treetop. Trips are great for kids, but inappropriate for those under age 6. Their curriculum is targeted at adults and engaged youth. Because the purpose is nature observation, please don’t bring dogs. The next Get Out! Nature Walk takes place on Wednesday, Nov. 15, from 1:30 to 3 p.m. at Sabbathday Lake Shaker Village, 707 Shaker Road. The curriculum is Winter Weeds, led by volunteer Karen Herold. She is a Natural Resources Council of Maine board member. 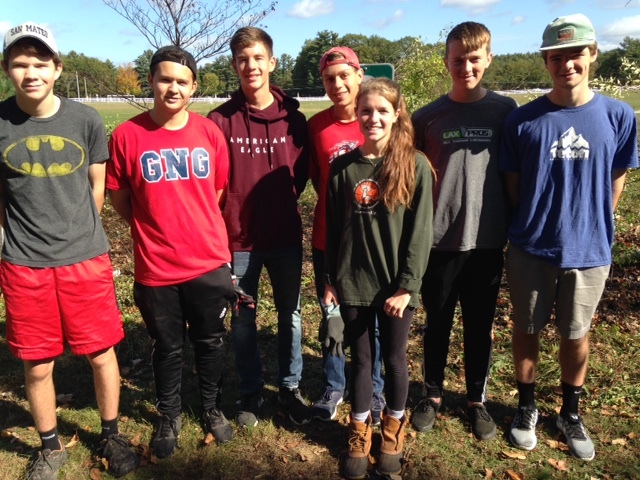 On Saturday October 14th, students from the GNG High School Community Service Club worked with members of the New Gloucester Environmental Resources Committee for several hours clearing brush and invasive plants in an area near the playground and shelter. They also helped plant forsythia in another area. They were hard workers and most enjoyable with which to work. The committee thanks them very much. Below is a list of the names of these wonderful workers. Is radon a problem in the air and/ or water in your home? After smoking, radon is the second leading cause of lung cancer. New Gloucester has areas with high radon levels. High concentrations of radon can be removed from your home’s air and water. To find out more, visit the New Gloucester Library during the month of October where the Environmental Resource Committee has a display about radon. A local laboratory has provided free water and air testing packets as well as a coupon good for October for a 20% reduction in individual test costs. With the coupon, each test will cost $28.00. 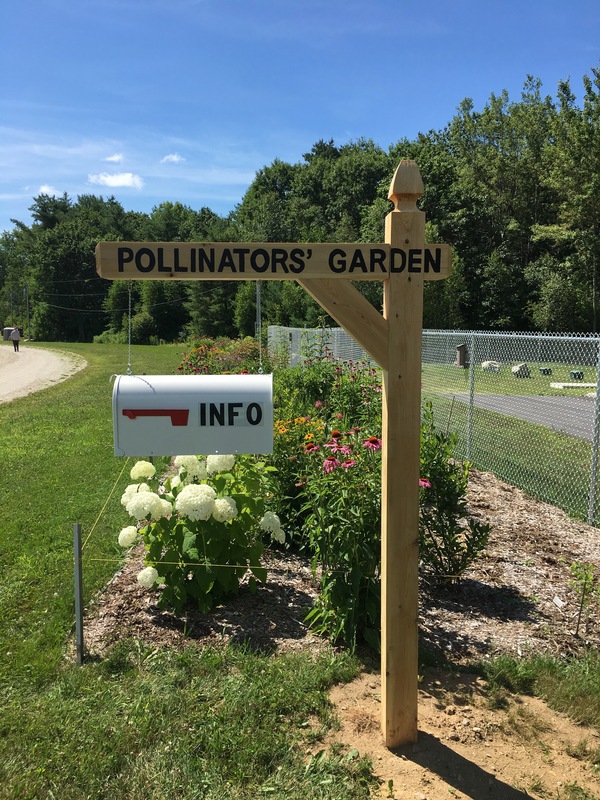 Pollinators”Garden at the Fairgrounds in Full Bloom!! The Pollinators’ Garden at the Fairgounds is in Full Bloom!! Check out the garden and see the many types of pollinators’ that are using it. 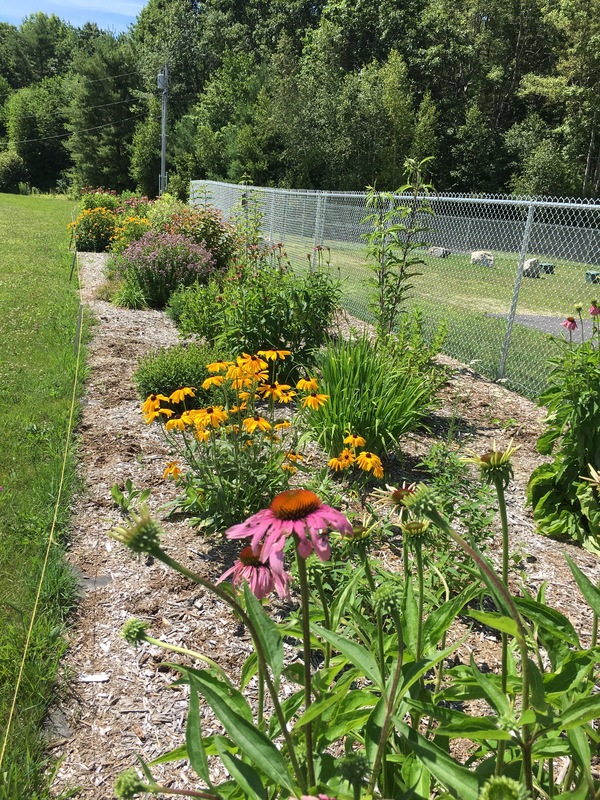 This is a demonstration garden that was planted by the Environmental Resource Committee of New Gloucester to encourage people to plant appropriate and easily cared for plants in their yard for various types of pollinators to visit. The mailbox has information on the botanical and common names of the plants used as well as other information about the planting of the garden. Use beneficial nematodes for grub control. Moles eat grubs that are in your lawns and gardens. To get rid of the moles you must get rid of the grubs. One way to do this organically is to use nematodes. Nematodes are microscopic non-segmented worms which occur naturally in soils all over the world. Beneficial nematodes attack only soil-dwelling insects and leave plants alone. Beneficial nematodes and the bacteria they spread are not known to be harmful to humans, animals, plants, earthworms and other non-targeted organisms but they do aggressively pursue insects like grubs. In field studies, they have been shown to be as much as 96% effective against Japanese beetle grubs. Although many species of beneficial nematodes are available, Heterorhabdidis bacteriophora (Hb) are most effective against Japanese beetles , European chafer and other grubs that are lawn pests. Hb nematodes work better because they are cruiser nematodes that burrow down in the soil searching for deep soil-dwelling pests. They also have a special “tooth” that help them get into the grub. NOTE; The best time to apply Hb nematodes is mid to late August. They are shipped in the juvenile stage and can be stored in the refrigerator for up to 2-3 weeks and are applied on an overcast day, preferably at dusk. The package is very small, 4”square at the most, and contain about 1 million nematodes. A handheld sprayer or hose-end sprayer is used to spread them. Directions are included when the package is purchased. Nematodes are available locally at Paris Farmers Union, O’Donal’s Nursery, Skillin’s Greenhouses, Fedco Seeds, and online at gardeners.com.